We fixed a lot of ruts during the Conejo Spring Trailwork Day on March 18th! 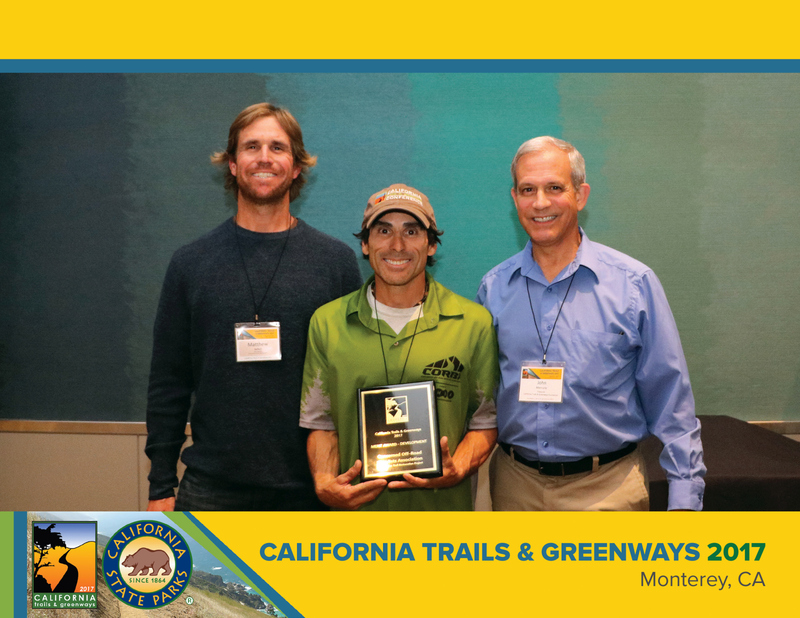 President’s Message: California Trails and Greenways Conference – Ken Burton Trail Restoration Project Wins Award. The 2017 California Trails and Greenways Conference (CT&G) was an extra special conference for CORBA. CORBA has been involved with the conference for more than 25 years. The CT&G Conference brings together trail advocates, nonprofits, and land managers. California State Park employees are able to earn continuing education credits, and district trail coordinators from around the state meet here annually. CORBA was nominated and received the Merit Award for Development for the Ken Burton Trail Restoration Project, which saw 100 volunteers put in over 1600 hours into the restoration of the trail last year. Accepting the award for CORBA were Steve Messer, who led the project, and Matt Baffert of the Mount Wilson Bicycling Association who contributed significantly to the project, and who were also the original builders of the trail in the early nineties. Kurt Loheit, one of CORBA’s founders who led IMBA’s early involvement in trail design and construction, received a Lifetime Achievement Award for more than 25 years of volunteerism and trail advocacy. Kurt was instrumental in developing the trail design principles that have put IMBA at the forefront of sustainable trail design. Also receiving a lifetime achievement award was Ron Webster, a Santa Monica Mountains Trails Council and Sierra Club trailbuilder who constructed over 35 miles of the Backbone Trail. The National Park Service received an award in the Acquisition category, for the acquisition of the last private property segments of the backbone trail just in time for the trail to be completed and designated a National Recreation Trail last year. Many California IMBA Chapters were represented at the Conference, which gave us a great opportunity to meet and discuss statewide matters of importance to the Mountain Biking community. The Chapters were also able to meet with Dave Wiens, IMBA’s new Executive Director, and discuss IMBA’s future, the Chapter program’s future, and the apparent disconnect between issues of importance to California mountain bikers and those of IMBA. Chapter leaders came away from the meeting encouraged and appreciative of Dave’s willingness to work with the Chapters. Electric Mountain Bikes were a hot topic of discussion, with E-MTB manufacturers offering test rides during the conference and at Sea Otter. Currently State Parks allow Class I e-mtbs on any trails where bicycles are allowed. However, that policy is under review and may change. Federal land managers all consider e-MTBs as motorized, and restrict them to OHV approved routes also used by motorcycles, 4x4s and side-by-sides or quads. Local land managers policies vary across the state. It was not coincidence that the conference was timed to allow conference attendees to then attend Sea Otter, which began the day after the conference. It made for a great week of advocacy, bike riding, and trail talk. To see the unabridged report on the CT&G Conference, check out the article in CORBA's blog. March 18, 2017: COSCA Spring Trailwork Day. Due to extensive damage to the trails in from the severe rains this winter, the original plan to build a new trail segment was shelved. Instead, we fixed ruts and built drains on existing trails in the Conejo Canyons/Western Plateau area. Sixty-Five volunteers signed in on Saturday morning to help, almost half of them from various Meetup groups, including CORBA’s. We had planned to split into 4 crews, each of which was to tackle a different section of the trail, mostly on the Hawk Canyon Trail. The CORBA crew tackled the new Baxter Singletrack Trail that was built last October during the Conejo Annual Trailwork Day. We filled in lots of ruts, built at least four new drains and cleaned out a couple of old ones. Despite all the drenching we’ve had, overgrown brush wasn’t a significant problem. You can see the full report on our Conejo Spring Trailwork blog report, and can see the photos directly at the event photo gallery. April 22, 2017: Grasslands Trail reroute in Malibu Creek State Park for Earth Day. 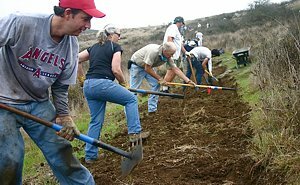 A few dozen volunteers gathered at Malibu Creek State Park on Saturday Morning, Earth Day, to help spruce it up. There were three main projects: to pick litter out of the creek, to paint over graffiti, and to build an extension to the Grasslands Trail. CORBA and other mountain bikers worked on the new trail. A number of years ago, a steep fall-line trail that connected the Grasslands Trail to High Road was closed because it was not sustainable. It was planned that a new, contour trail would replace it and the first phase of the new trail was completed this past Saturday! You can see the full report on our Earth Day Trailwork blog report, and can see the photos directly at the event photo gallery. 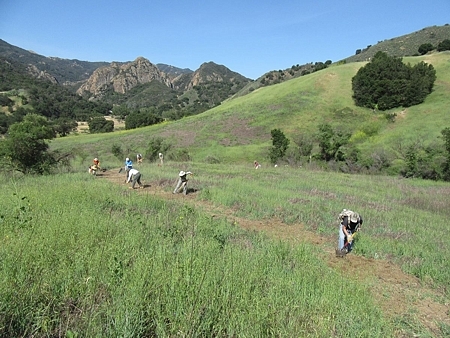 April 28-30: Santa Monica Mountains Trails Day in Pt Mugu State Park. Saturday morning, we hiked 1.5 miles up the Wood Canyon Vista Trail to the work area, about 2/3 of the way to the top, and proceeded to work down. The area of greatest concern was at the start of our work area where the trail passes through a grassy area and is solid clay. Most of the rest of the trail is very rocky. This clay section is pliable, quickly becomes depressed in the middle where a rut erodes when it rains. This section of the trail was completely restored during trailwork in February 2015, yet it was as rutted as ever after just two years. A narrow but deep rut had developed in the middle of the trail, just wide enough for a mountain bike tire to slip in and get jammed. We learned that leveling the trail doesn’t last here, so instead we cut a drain in about every 50 feet. Overall, we dug out 26 drains over 2100' of trail and filled in about 500' of rut! Well done, everyone! While the CORBA crew was working on the Wood Canyon Vista Trail, the other volunteers (about 60 of them) worked to restore the Upper Sycamore Trail where Sycamore Creek crosses it a number of times. By all accounts, this trail was decimated by the stream. This is a very shaded trail in a deep canyon and popular with hikers, but it’s in the Wilderness Area and so closed to mountain biking. On Sunday, the much smaller total group of about 30 worked on two areas of the Upper Sycamore Trail. You can see the full report on both days on our 2017 SMM Trail Days blog report, and can see photos directly at the event photo gallery. Los Angeles County has begun planning outreach for the Santa Susana Mountains. 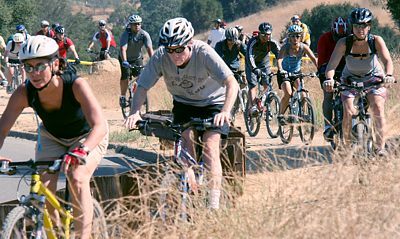 In 2012, CORBA gave significant input to the Santa Susana Mountains Trail Master Plan (phase I). In 2015 CORBA then spoke in support of the plan before the County Board of Supervisors. Now they’re about to start on Phase II, which includes the northeastern portions of the Santa Susana Mountains including Stevenson Ranch (Phase II.A), as well as a portion of the west San Fernando Valley foothills (Phase II.B). We’re encouraged that Supervisor Kathryn Barger is continuing the fifth district’s support for trail planning and outdoor recreation. An overview public meeting is scheduled for April 18. A meeting for the mountain bike community will be held on May 4th. Unfortunately, that conflicts with the first event of the Race Pedalfest series. However, mountain bikers are welcome to attend the other user group meetings, but the focus may not be on mountain biking needs. Anyone can provide comments at any time through the project website; site-specific comments can be captured through the wikimap tool (to be launched soon on the project website), or trail users can email the project lead, Zachary Likins, directly. Saturday May 6th is the next skills clinic.